Should students be required to take physical education classes? When I think back to my years as a student from kindergarten through my senior year, I can picture to dread of having to go to gym class. I did not mind so much in elementary school because there seemed to be a lot less pressure and just a lot of fun physical activity. Boy did that change when I got into middle school. For me personally, my gym teachers from 6th grade on were like drill sergeants that expected every student to excel at every sport. 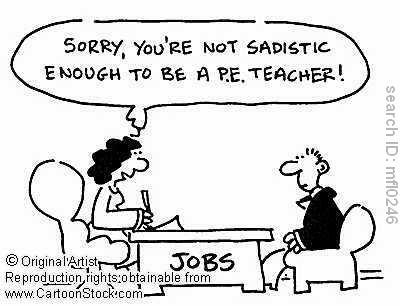 I don’t have any memories of a gym teacher that made physical education fun or rewarding. I always felt like they constantly barked orders and just exhibited a hatred of having to do their job day after day. I never had a desire to go to gym class…in fact I hated it. There were certain activities (sports) that I was ok (or maybe even good at) but there was others that I absolutely struggled with. I have never been a strong runner and when the time of year fell upon us when we had to run track I absolutely dreaded it. We were required to run a mile in 15 minutes and if we didn’t we would have to do it again during the next class (and as many after that until we did it in 15 minutes). In my school days teachers never seemed to find out about physical limitations or possible health problems. I can’t explain it but my body (and still to this current day) just doesn’t move fast when it comes to running. I have been running more as of recently (and have less than a month until my first 5k) but I run at my own pace….what I am comfortable with and what I know my body can handle. These gym teachers were pushing us without even asking how we were feeling…because they assumed that those of us that struggled with just lazy or just a bunch of whiners. Now don’t let my experience make you think that I don’t think that physical education should be taught in schools. I absolutely do think it should. I believe the methods need to be changed though (maybe they have but with all of the budget cuts and such I highly doubt they have). I know you will find those teachers phys. Ed. Teachers every once in a while that are quite inspirational but they seem to be a dime a dozen nowadays. Physical education has become a requirement that kids absolutely dread because they are pushed to do activities and meet requirements but they are not learning in the process. I believe that physical education should include extensive education about nutrition and health and should held children, youth and adolescents learn more about how their body works. Kids should not just be pushed to do 50 layups then just call it a day or forced to run a mile in a specific time but not learn the value and importance of exercise. In the United States, childhood obesity is becoming a HUGE problem…some may even call it an epidemic. It took me until about the age of 25 or so to realize the importance of health….I was sick of being fat and I had to educate myself. The schools have this great tool….these knowledgeable (well hopefully they are knowledgeable) gym teachers that can educate students on reading food labels and practicing a healthy lifestyle as well as getting them excited about physical fitness. Not every kid is going to excel in every sport….some may excel in none…..but there are still tactics that can be used that can get them excited about working out (and working out does not have to be a mundane routine). Schools have this great tool that could pave the way for children to be healthier both mentally and physically but unfortunately it is failing. I believe teachers are miracle workers (a lot…unfortunately not all). I truly think it takes such a special person to be a mentor to young children. Many people wouldn’t put gym teachers in the same category as those teachers that educate from a classroom all day. That could not be further from the truth. Gym teachers are those that have great knowledge about the human body and athletics and the benefits of healthy nutrition and exercise. These are the people that have the ability to shape young minds and show them how to live a healthy life. These are the people that could guide children to exercise regularly and could even potentially prevent the onset of depression or anxiety because of this regular physical activity. These are the people that could motivate children to push themselves just that much further to reach their goals. I tip my hat to ALL teachers that can go to their schools every single day and fall more and more in love with their jobs. The people that feel truly blessed to be given the opportunity to shape young minds and voluntarily be their mentors. Unfortunately, we have far too many teachers in the entire system that have completely given up. We have become a nation that is becoming lazier and lazier by the day and will only fight for so long. I may not be a parent but children today and children of the future need us to fight for them every minute of every day. There is NO excuse for children to be lazy….they are only lazy because we are allowing them to be lazy. I am far from perfect and when I was young I did not get excited about anything when it was health or fitness related. I was never excited about it because no one was ever showing me that there was anything to be excited about. I now know at the age of 33 how much I love exercise and how much I love learning about health and practicing a much healthier lifestyle. I still eat things that I probably shouldn’t and I will slack from time to time but I have changed my life drastically because I learned all of the benefits. No child should look in the mirror and hate their body and dread going to gym class because other students are going to make fun of him/her or the teacher is going to push him/her to do exercises that are very difficult that he/she does not feel comfortable with. Gym teachers have this great opportunity to take on self-images issues head-on and teach children to love their bodies….to treat their bodies like a temple. I guess I just see things having the possibility of being so different and maybe I think too much into things but I have seen first-hand many young girls talk about loathing the way they look and so much could be prevented if we were to just teach kids at a young age to practice a healthy lifestyle not only physically but also mentally. I think in primary school there should be 30 minutes set aside every day for physical activity. In high school at least three days a week should be dedicated to health and physical activity teaching and learning. Ahhhh Physical exercise classes were a great pressure for me all the way from elementary to high school. I cannot tell whether they were necessary trials in life, or just a torture…fortunately teachers I met were all kind “out of” the classes. I was bullied throughout my entire school career, so I enjoyed hockey because it gave me license to bash people in the shins and shove them out of my way to get the ball. A very aggressive game and I excelled at it. I completely refused to join the school hockey team though, in spite of my teachers begging me every week. I hated tennis and netball, loved badminton and was particularly good at basketball – and I resented being told that I couldn’t join the basketball team because (yes, you guessed it) “You’re a girl”. I was better at basketball than many of the boys *on* the team! Imagine my annoyance when my sister (who was a year behind me in school) informed me that a girl’s basketball team had been formed. Naturally, this is after I left school. I agree that athletics/gymnastics are vital to the health and fitness of our young people – but the attitudes of the teachers must change. I also think that swimming ought to be included in the senior school curriculum. Not only is it a pleasant activity, but it’s a lifesaving skill. When people tell me they can’t swim my mind boggles!